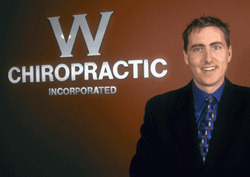 Welcome to W Chiropractic in Missoula! I established my practice in 1996 and chose Missoula because of its natural beauty and the size of the town. Having done an internship here, I felt like the people of Missoula were very health oriented. I built a brand new clinic in 2007 halfway between the downtown and the North Reserve area in the direction I felt like the city was growing. This has served our patients well because of the ease of access and plenty of parking. After having bought raw land, I had the wonderful privilege of getting to design my clinic, literally from the ground up. I wanted a state of the art building that was pleasing to the eye and very energy efficient (green on the environment) to operate. I chose a modern look for the inside of the clinic to depict the cutting edge technology that my practice has always embraced while not losing site of the basic roots of chiropractic. I wanted the feel of my clinic to be “high tech and yet high touch” at the same time. Our patients love the clean, simplified feel to the clinic. My goal has always been to ensure that the focus is on the person we are serving not on us. Patients that are at the point of embracing life enhancing decisions rather than life destructive decisions always seem to get the best results. They may or may not be in pain but they want to start working toward improved health naturally and safely. They are ready to try a different approach to what they have been doing and are simply looking for someone they can trust to show them the next step. Patients often get ahead of themselves. How long will it take me to get well? What is it going to cost me in terms of time, money and energy? These are very good questions but I try to slow that patient down and have them simply take the next step. Start with getting my opinion. Twenty dollars and 30 minutes of your time will reveal where we need to go from there. My dream is for the individuals of my community to see how beautifully and wonderfully made they are. They have huge untapped potential waiting to explode in terms of creativity, energy and power. The key for expressing their uniqueness is taking the next step…and then the next step. Just as the health of our bodies are reliant on the individual cells, so goes our community. The health of our town, state and nation are directly tied to the health of the individual. Let’s get well together. Take the first step towards relief by calling our Missoula practice today and making an appointment to discuss your health goals.